It is fully compatible with all mainstream recording applications on both Windows and Mac OS based computers, as well as the Apple iPad using R˜DE Rec, GarageBand, or any other recording app that accepts an external microphone. Use on the Apple iPad requires a suitable USB connection adaptor, such as the Apple Camera Connection Kit. A premium pop-filter is included, which fits onto the base of the mic, positioning the filter the ideal distance from the capsule to minimise plosives (hard ˜B', ˜T' or ˜P' sounds that produce a harsh sound) during singing or speech. 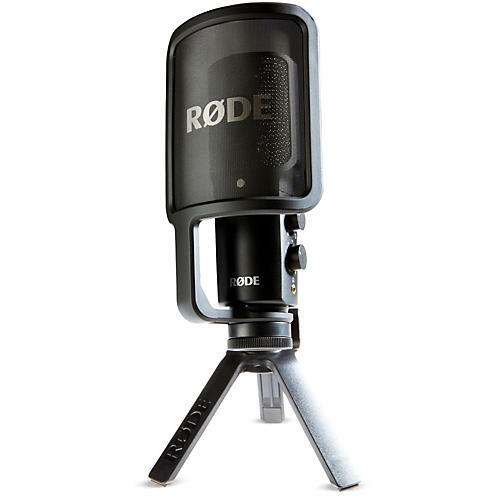 Also provided is a high-quality stand mount with industry standard 3/8" thread, desktop tripod stand that allows the NT-USB to sit at a comfortable height on a tabletop, and a pouch for storage of the microphone when not in use.